Crash course Day 1 - What is PLM? WHAT’S THE DEAL WITH PRODUCTS? Products are part of our everyday life. Whether it’s a refreshing soft drink or the t-shirt you’re wearing, we share our life with products. PLM stands for Product Lifecycle Management, and it focuses on the product. Companies revolve around products: they define the company’s identity and are the source of its wealth and revenue. Once they contained only mechanical parts, but products are becoming more and more complex. Sensors, software, and connected data have become an integral part of modern products. As a result, managing product information effectively is a must for companies that want to remain competitive in today’s business environment. FIRST THING FIRST: WHAT IS PLM? PLM is a framework that helps companies manage their product information and follow business processes through a product’s full lifecycle. Over the next five to ten years, the biggest business gains will stem from getting the right information to the right people at the right time. That’s what PLM is all about. HOW DO WE DEFINE PRODUCTS? Products are defined by data. Data has become a new currency and a true core asset for firms. Product data is valuable by itself: yet its value increases exponentially when integrated with other data, such as maintenance history or related products or services. The capacity to unlock the full value of product data is a key competitive advantage. It is often said that PLM is about managing a product thought its whole lifecycle, “from cradle to grave” or “from sunrise to sunset”. That’s why true enterprise PLM requires building an end-to-end framework to support corporate processes, starting with product development and extending to after-sales. WHERE IS ALL THAT PRODUCT DATA? Think about your product. After clarifying what the product is supposed to do and how it should work, designers will start to sketch its geometry using CAD tools. While designing your product, you need to keep in mind cost-competitiveness, production feasibility and compliance with standards. Understanding how parts should be positioned so that the product can be manufactured, knowing when it makes sense to combine or separate parts, and thinking about the right tooling is essential to ensure that what you’ve designed will actually work in the real world. You’ll also need to check that your product complies with regulations and industry standards. Regulations apply to several product components, and they might differ depending on where the product will be shipped and how it will be used. Negotiating supplier contracts and purchasing parts and services on time eases the shipping process and secures on-time product delivery. Your sales team will sell the product to your customers, and service it when necessary. To do that, they need to put together all the data that describes the product from a commercial perspective. You get the point. Sharing product information across the various teams within your organization is essential to an efficient workflow. But ensuring that everyone has access to the data they need is not an easy task. Each department has a different focus, and therefore relies on specific applications to work effectively. Being able to capture and pull together all the key data from those tools to describe the product through its lifecycle is in the DNA of PLM. 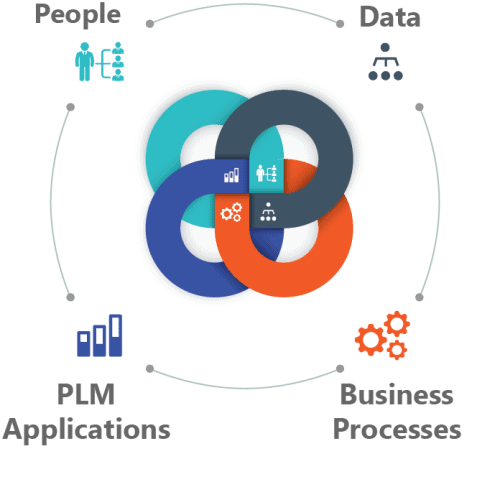 PLM integrates people, data, processes and business systems, and provides a critical product-information backbone. Effective PLM isn’t just about choosing the right technology. The challenge is to connect all the information pieces in a meaningful way, through the lifecycle process, so that the data flows smoothly. Getting a complete representation of the product, sharing information effectively across disciplines and platforms, and defining who needs what data, when, and who owns it, can be a huge thing. Yes, you’ve guessed right: PLM is complex. But if you get it right, it can be extremely powerful, and can actually make your company stand out. Connecting the dots across different applications through the lifecycle process is a true competitive advantage. A compelling vision, a strategic approach and a good plan for PLM will reap real rewards. Over the next 6 days, we’ll learn how PLM can help a company manage its most valuable asset by integrating people and information into processes. And we will explore some secret ingredients to make it work. Still with me? Yes! That means we’ll be learning more about the business processes tomorrow! See you soon! P.S: Loving the course so far? Help us spread the word by sharing it on social media!